Endorsed by the American Academy of Pediatrics, the report draws on more than 100 studies. “The qualitative review concludes that multilingualism is an advantage to be nurtured and maintained rather than a risk factor to be eradicated early in a child’s life,” Education Week explains in a recent review of the report. In the Education Week piece, Allyssa McCabe, a lead author and a psychology professor at the University of Massachusetts Lowell, debunks two myths covered in the report. Indeed, what monolingual and multilingual children have in common is “that more language exposure results in more language learning.” So whether parents speak English or another language, their goal is the same: create high-quality language environments by, in part, consistently using rich vocabulary, a positive tone, and sentences of varying complexity. 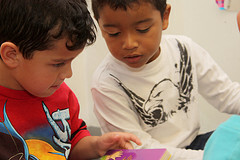 A strong foundation in early literacy influences children’s literacy later in life as they progress through school. Research has found, for example, that kindergarten vocabulary is highly correlated with reading ability through high school. The final section of the report calls for getting the word out: sharing this information through mass media, home visiting programs, and child care centers. The word can also be spread by policymakers and by early childhood professionals, such as speech and language pathologists, psychologists, and pediatricians who see children and families during routine check-ups. As the United States grows increasingly more multilingual, it could tap this natural resource by helping young children engage in robust language environments starting from birth. I could not agree more with this article! I grew up in a bilingual household and now teach pre-k to bilingual children. At conference time with the parents, I stress the importance of dialogue and storytelling in the family’s native language. I offer opportunities for parents to come into the classroom and read to the students in their native language as well. (I have all Spanish speaking students so this is fairly easy in my situation). I feel that it develops a rapport with the parents, as well as shows that I value their heritage, as well as their children. These opportunities offer more exposure to language and literacy, which in turn, may have a positive influence on student success, as this article suggests.